The current trend towards increasing intensification and diversification of global aquaculture has led to its dramatic growth, thus making aquaculture an important food-producing sector that provides an essential source of aquatic protein for a growing human population. For both developed and developing countries, the sector is recognised as creator of jobs and an important source of foreign export earnings. The expansion of commercial aquaculture, as is the case in commercial livestock and poultry production, has necessitated the routine use of veterinary medicines to prevent and treat disease outbreaks owing to pathogens, assure healthy stocks and maximise production. The expanded and occasionally irresponsible global movements of live aquatic animals have been accompanied by the transboundary spread of a wide variety of pathogens that have sometimes caused serious damage to aquatic food productivity and resulted in serious pathogens becoming endemic in culture systems and the natural aquatic environment. The use of appropriate antimicrobial treatments is one of the most effective management responses to emergencies associated with infectious disease epizootics. However, their inappropriate use can lead to problems related to increased frequency of bacterial resistance and the potential transfer of resistance genes in bacteria from the aquatic environment to other bacteria. Injudicious use of antimicrobials has also resulted in the occurrence of their residues in aquaculture products and, as a consequence, bans by importing countries and associated economic impacts, including market loss, have occurred. As disease emergencies can happen even in well-managed aquaculture operations, careful planning on the use of antimicrobials is essential in order to maximise their efficacy and minimise the selection pressure for increased frequencies of resistant variants. The prudent and responsible use of veterinary medicines is an essential component of successful commercial aquaculture production systems. The FAO/AAHRI Expert Workshop on Improving Biosecurity through Prudent and Responsible Use of Veterinary Medicines in Aquatic Food Production was convened in Bangkok, Thailand, from 15 to 18 December 2009, in order to understand the current status of the use of antimicrobials in aquaculture and to discuss the concerns and impacts of their irresponsible use on human health, the aquatic environment and trade. Such discussions became the basis for drafting recommendations targeted for both government and private sectors and for developing guiding principles on the responsible use of antimicrobials in aquaculture to be considered as part of future FAO Code of Conduct for Responsible Fisheries (CCRF) Technical Guidelines on Prudent and Responsible Use of Veterinary Medicines in Aquaculture. 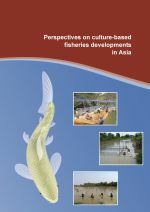 Because aquaculture is expected to continue to increase its contribution to the world’s production of aquatic food, offer opportunities to alleviate poverty, increase employment and community development and reduce overexploitation of natural aquatic resources, appropriate guidance to aquaculture stakeholders on the responsible use of veterinary medicines has become essential. 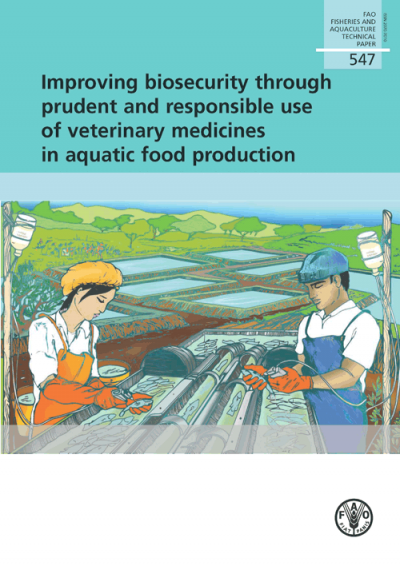 Safe and effective veterinary medicines need to be available for efficient aquaculture production, and their use should be in line with established principles on prudent use to safeguard public and animal health. The use of such medicines should be part of national and on-farm biosecurity plans and in accordance with an overall national policy for sustainable aquaculture. This publication is presented in two parts: Part 1 contains 15 technical background papers presented during the expert workshop, contributed by 29 specialists, and which served as a basis for the expert workshop deliberations; Part 2 contains the highlights of the expert workshop.